With Congress on vacation the TQ ratings of congressional leaders were unchanged. However, the campaign for the Republican nomination goes on and that's where the action was. No sooner did Panderbear add Newt Gingrich to the rankings than he uttered yet another Pants-on-Fire statement and plunged into a statistical dead-heat with Senate Majority Leader Harry Reid. Governor Perry's latest false statement dropped him into a tie with the perennially prevaricating Republican National Committee. 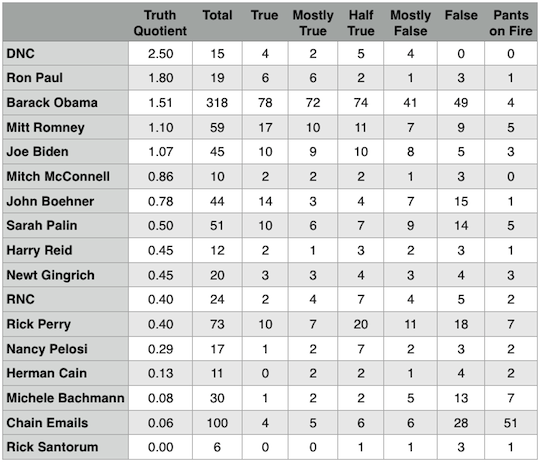 Believe it or not Sarah Palin's pathetic TQ of 0.5 now places her above the median!